A lot has happened since SolarCity last reported earnings, some good and some not. There are more potential changes coming, too. It's not the only solar company feeling the impact of an uncertain market. Shares of solar installer competitor Sunrun Inc. and solar panel manufacturer and utility-scale solar project builder SunPower Corporation are all down at or near double digits. Only shares of SunPower competitor First Solar are up over the period, due to that company's signing of a major deal for solar utility projects with a California utility. 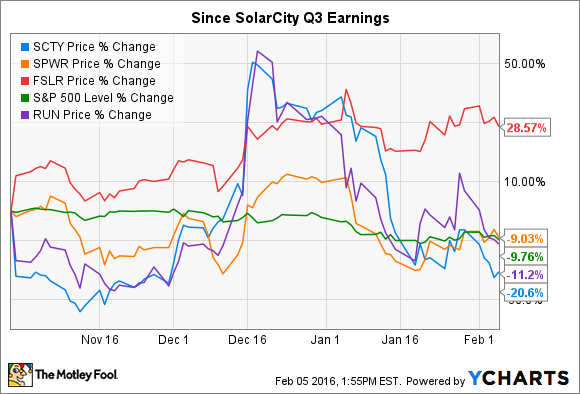 What should investors expect next week when SolarCity releases earnings? Just as important, what will management have to say about how they are positioning the company going forward in an ever-changing landscape? The biggest factor in those cost increases was the aggressive expansion of the company's sales base, which over time tends to fall as a percentage of sales as those investments generate more sales, but with the (at the time) expiration of the 30% federal Investment Tax Credit scheduled for year-end 2016, management thought it prudent to start taking steps early in the year to focus on reaching positive cash flows by year-end. Management said that growth would still be strong, forecasting for about 40% MW installation growth in 2016. In mid-December, the ITC was extended at its 30% credit level until 2019 and a ramp-down in the years to follow. This was great news for the industry, especially for residential installers such as SolarCity and Sunrun, which heavily benefit from those tax credits and the ability to depreciate solar assets when leased to customers under long-term contracts. Customers also benefit since the tax credits make solar competitive against utility power costs, reducing the cost people pay for solar. Frankly, in many markets, the ITC is what makes solar viable. But following this good news, Nevada utility regulators slapped the residential solar industry across the face, ending net metering in the state. Net metering is arguably more important than the ITC, since it allows solar users to benefit from daytime solar production by getting meter credits with their utility and then using those credits to cover power consumption at night. SolarCity announced it would immediately cease operations in the state, eliminating more than 550 jobs there. The decision by the Nevada utility commission essentially killed rooftop solar in the state, and SolarCity estimates that it could cause as many as 5,000 Nevadans working in the industry to lose their jobs. This move shocked solar investors, and since the December 21st announcement that it was considering ending net metering, shares of SolarCity and Sunrun are down 40%. Since then, California regulators extended net metering in that state (NEM2, as the new metering regime is known), a decided win for residential users and for solar installers. Utilities also got some things they wanted to help offset grid costs as well, and some in the solar industry think that over the long term the changes as part of this policy could weaken solar lease and PPAs, which are central parts of what SolarCity is building. But Arizona is next on the docket, with its state utility board set to review its metering policies early this summer. And while it's unlikely that the state's regulators will follow Nevada -- Arizona is one of the largest solar states in the country, with tens of thousands of solar jobs, and the second-most residential solar customers in the country behind California -- it is unlikely that unadulterated net metering remains in place. It's sounding more and more like the state's utilities will be able to charge a flat fee to help offset grid costs. In other words, it's likely to be a compromise and what more states will shift to over time. SolarCity's guidance for the fourth quarter was for 58%-69% growth in MW deployed, but the big focus is likely to be on the company's bottom line going forward, as well as its ability to rein in the expansion in its operating expenses in recent years. But as important as those areas are, management's plans regarding the impact of Nevada on sales growth, the effects of the extended ITC (it's good for the long term, but will it reduce urgency for residential solar customers to act this year? ), changes in California with NEM2 and the upcoming -- and uncertain -- changes in Arizona probably matter even more. The bottom line is SolarCity will need to adapt to these changes, and it's just as important to pay attention to how CEO Lyndon Rive and his team are responding to the changes and positioning the company, after reviewing its financial performance from the prior quarter. Buckle up, solar investors. It's going to stay pretty bumpy.